Tonight Mickey and I went to visit my grandma again. This time the kids stayed with my parents. They had dinner with them. My brother, B, stopped by. He must have smelled the beef and noodles from his house. It's one of his favorites. While eating, Kade looked behind him at all of us "kids" in our senior pictures. He said, "That's my mom. She has big hair." This made everyone crack up. (Yes, I did have big hair at 17 and for a while after that. It was long, thick, and curly, not teased out like in the 80's. Now it's just short and big, more afro like.) The kids always find something to do at Nana and Papa's house. 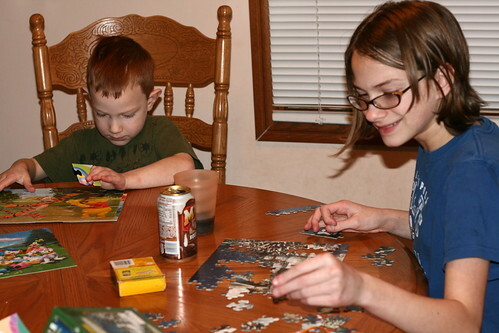 When we came back to get them they were putting puzzles together and the legos had been out. And of course Nana let them all have a can of pop. That's something we regard as a rare treat in our house. They get plenty of sugar from other things. An example can be found in the post below.